Mövenpick Hotel Mactan Island Cebu is a 245-room Mediterranean-inspired beachfront luxury hotel located on the Island of Mactan, a popular holiday island destination in Cebu, Philippines. It is part of Mövenpick Hotels & Resorts Group, a Switzerland-based international upscale hotel management company with more than 80 properties under its management and represented in 24 countries in Europe, Africa, the Middle East and Asia. 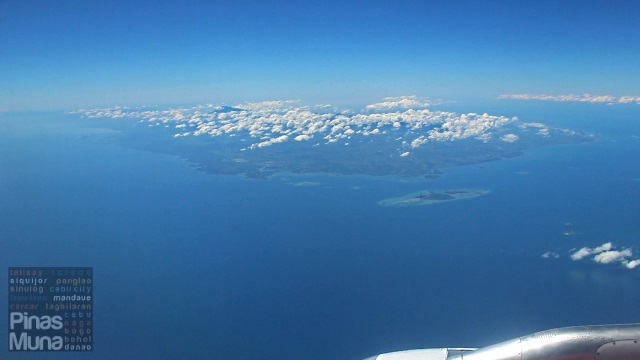 Located just 6 kilometers away from Mactan-Cebu International Airport which receives daily flights from major cities around Asia and Middle East, Mövenpick Hotel Mactan Island Cebu is an ideal holiday destination for tourists coming from Korea, Japan, China, Hong Kong, Taiwan, Singapore and Dubai, among others. As soon as stepping into the hotel's lobby, the chalk-white walls, floor and ceiling with pops of turquoise, teal, azure, cyan, grey, olive and lime colors that drew inspiration from the coasts of Greece and the Balearic will immediately set the holiday mood to the arriving guests. Checking-in at the hotel is quick and efficient, following the Swiss values in service such as quality and reliability with a Filipino touch of hospitality that is warm, caring and personal. The Mediterranean-inspired design of the resort is also expressed in the interiors of its guestrooms and suites. Both the Deluxe Room and the Deluxe Ocean View Room measure 33 sqm and feature a Greek-inspired style with deep blues, turquoise and plenty of white. The rooms combine classic elements of Mediterranean design such as textured walls and ceramic tiles with a contemporary feel from its feature wall, bed, furniture and access pieces. 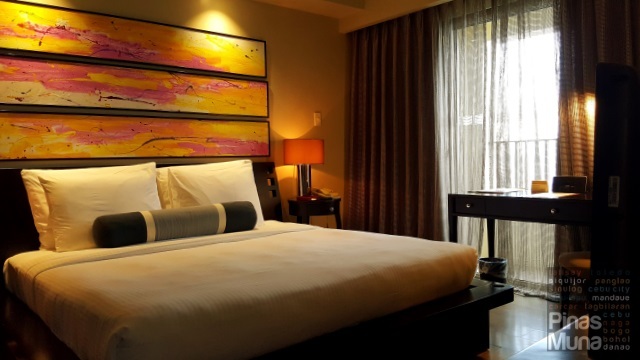 The rooms are equipped with a writing desk, a spacious wardrobe cabinet, an iron and an ironing board, a mini refrigerator, an in-room safe, a LED TV with international and local channels, coffee & tea making facility. Both room categories have a partial view of the Cebu Strait with the Deluxe Ocean View Room having its own private balcony. The Premium Ocean Front Room is a bigger room category at 45 sqm. 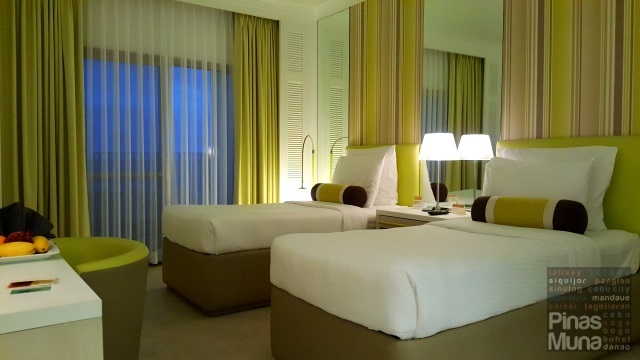 It is available in two themes, the turquoise blue interior (similar to the Deluxe rooms above) and the olive green interior which combines olive, dark olive and yellow-green colors. 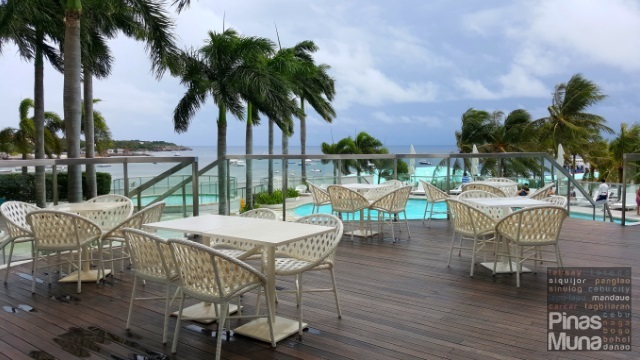 Just like the Deluxe Ocean View Room, the Premium Ocean Front Room also has a private veranda that faces the beachfront of the hotel with a view of the swimming pool, the beach and a panoramic view of the vast Cebu Strait. The three room categories have a standard bathroom set-up including a separate bathtub and walk-in shower, toilet installed with a bidet spray, a single basin and a wide mirror with an attached magnifying mirror. Chopard-branded toiletries are provided including body soap, shower gel, shampoo, conditioner and body lotion. Chopard is a brand distributed by ADA Cosmetics, a Germany-based supplier of hotel cosmetics. Aside from the toiletries, high quality and clean cotton towels are also provided. For an added luxury, guests might want to stay in a One Bedroom Suite Ocean View. Measuring 65 sqm, the suite has a king size bed, a writing table, a spacious closet cabinet, and an en suite bathroom with separate bathtub and walk-in shower. 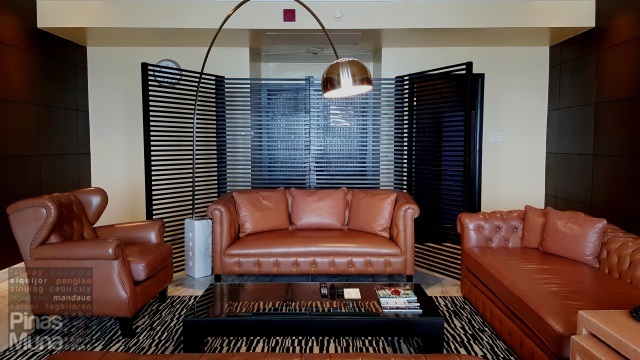 The suite also has a separate living room matched with upscale furniture and accent pieces including a LED TV with international and local cable channels, a coffee and tea making facility, a minibar, an iron and ironing board, and an in-room safe. Highlight of the stay in a One Bedroom Suite Ocean View is the breath-taking view of Mactan Island and the hotel's landscaped gardens from the suite's balcony. Located on the top floor of the hotel is the Presidential Suite. 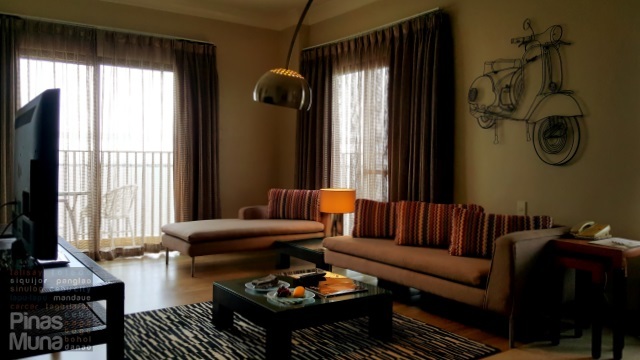 Luxuriously spacious at 125 sqm, the Presidential Suite features a living area furnished with tastefully selected leather couches and a spacious dining area. The Presidential Suite has two bedrooms. A larger bedroom is furnished with a king size bed while a smaller bedroom is furnished with twin beds. 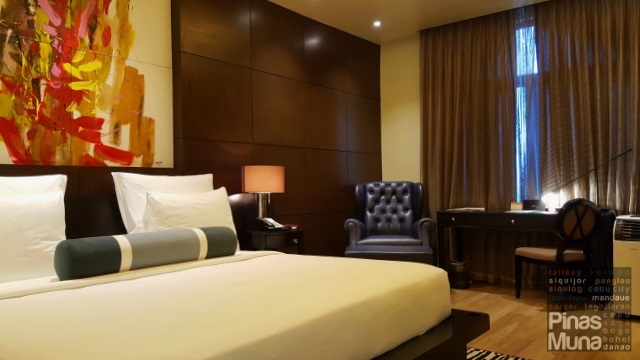 Both bedrooms have a work desk, a leather couch, a spacious wardrobe cabinet and are equipped with their own LED TV with international and local cable channels. 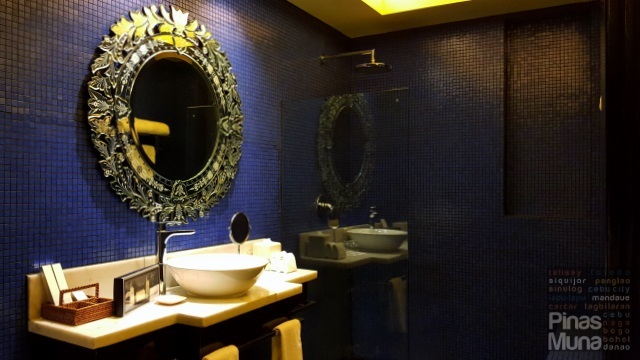 Each bedroom has its own en suite bathroom following the same Greek-inspired theme of blue tiles and white fixtures. Both bathrooms have a separate walk-in shower. 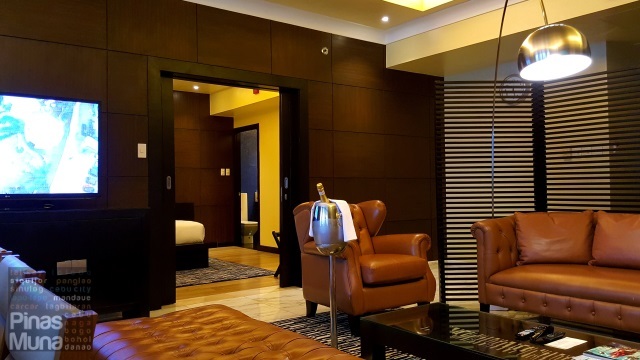 Highlights of the Presidential Suite include the large Jacuzzi inside the en suite bathroom of the larger bedroom and the suite’s balcony that affords its guests with a stunning panoramic view of Cebu Strait. The Presidential Suite is also the only room category which includes butler service. 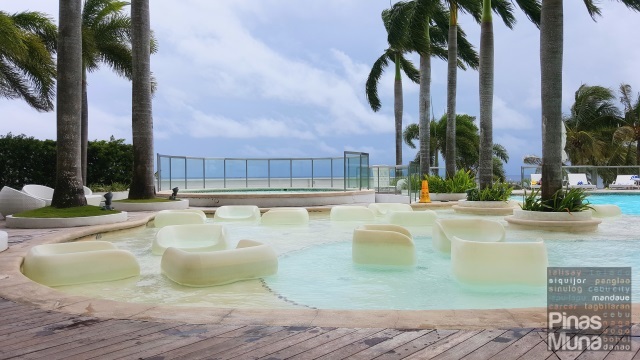 With its wooden deck, pool loungers and LED pool sofas, Mövenpick Hotel Mactan Island Cebu has one of the most stylish and beautifully designed swimming pools in the Philippines. Surrounding the swimming pool are towering palm trees that give a rather tropical resort feel to the area. The pool area has become one of the favorite spots for photo shoot by fashion and lifestyle magazines in the Philippines. Next to the pool is The Forum which features indoor and poolside lounges where guests can order light snacks, bar chow and tropical sips, alongside liqueurs and whiskey. For the ultimate refreshment to escape the tropical heat, you can order the Mövenpick Ice Cream which is a product of Swiss craftsmanship characterized by its authentic taste, amazing creaminess, and refined and well-balanced flavors. 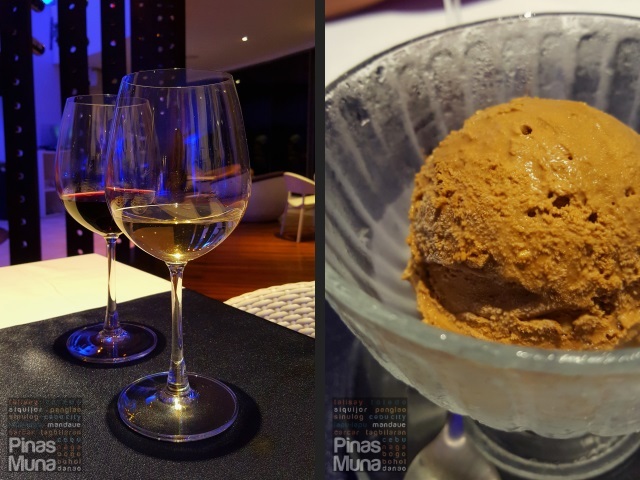 In the Philippines, Mövenpick Hotel Mactan Island Cebu is the only place where you can find this ice cream brand. 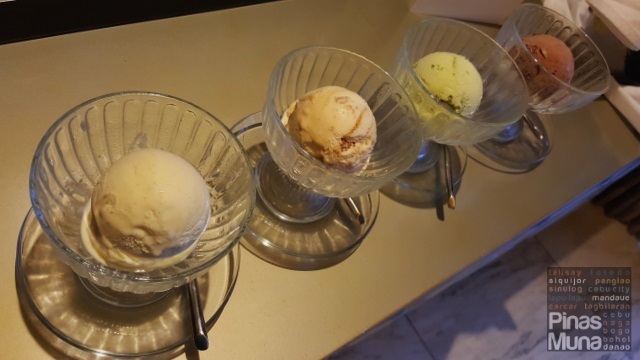 Available in eight flavors, namely, Swiss Chocolate, Caramelita, Pistachio, Strawberry, Vanilla, Espresso Croquant, Maple Walnut and Lemon & Lime, the Mövenpick Ice Cream is reason enough for your to keep coming back to Cebu. Our favorites are the Espresso Croquant, Pistachio and Caramelita. 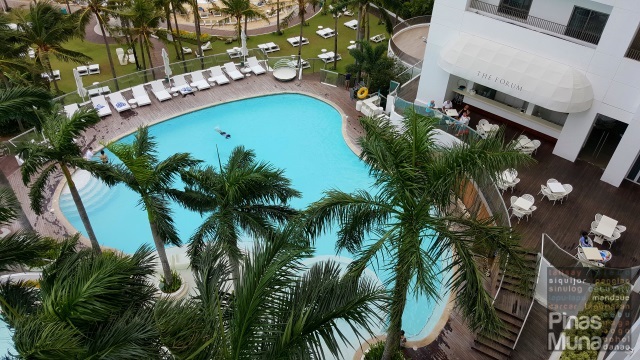 During your stay at Mövenpick Hotel Mactan Island Cebu, don't miss the chance to try out the specialty Swiss dishes at The Sails, the all-day buffet and a la carte dining restaurant of the hotel. We highly recommend the Pork Zurich Style made with thin slices of pork loin, pan fried with mushroom in creamy sauce and served with rösti, considered by many as the Swiss national dish. By four o'clock in the afternoon, make sure you don't miss the Chocolate Hour at the Lobby Lounge where guests enjoy complimentary treats made with Swiss chocolate. Located at the beach garden, the Spa del Mar offers a range of massage therapies which guests can enjoy in any of the treatment rooms and various relaxation areas around the hotel. 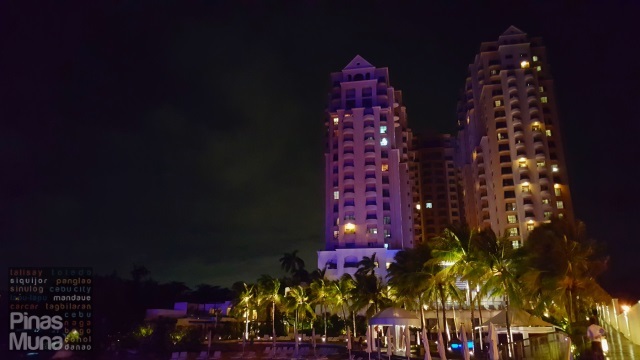 Come evening time, a whole lot more diverse dining options become available to guests staying at Mövenpick Hotel Mactan Island Cebu. Back at The Sails, guests can feast on international cuisines with the restaurant's themed dinner buffets at P1,600 nett per person. East Meets West during Sunday and Monday with a wide array of dishes from different continents, from Italian to Spanish, Chinese to Japanese, American to Filipino. Dished from Spain, Italy, Greece and the coast of Lebanon take center stage during Tuesday and Thursday with the Mediterranean Nights at The Sails. Wednesday is all about fresh sea food. 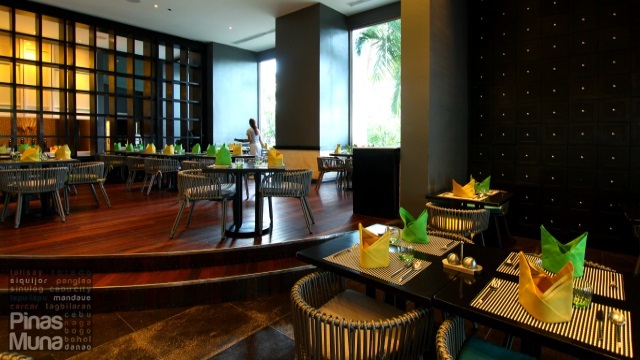 Sea Deep features the freshest tuna, salmon, mussels, oysters, prawns and crabs prepared in different ways and flavors. Experience Filipino Fiesta every Friday as The Sails highlights regional delicacies from around the Philippines for better appreciation of the different culinary heritage of Filipinos, matched by a lively cultural presentation and Filipino-style serenade “harana” (serenade) at the beach garden. During Saturdays, guests get to Explore Asia through the rich flavors and spices of Vietnamese, Singaporean and Thai cuisine, the delicious noodle dishes and sushi from Korea and Japan, and the delectable flavors of traditional Chinese cooking. 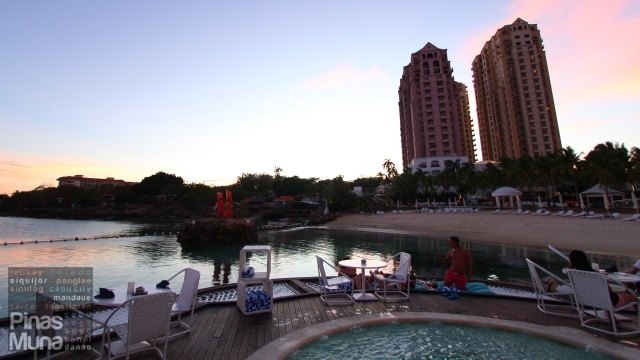 Recently named as one of the best bars and restaurants in Cebu, and one of the best party places outside Metro Manila, the Ibiza Beach Club is the place to see and be seen in Mactan Island. In fact, guests from neighboring hotels and resorts spend their evenings here because the parties at Ibiza Beach Club are simply the best you can find on the island. Highlight of the evening are the nightly live performances by the Ibiza show team, featuring live singing and dancing to retro pop, disco and Latin music, as well as daring fire dance and stunts. Another reason to visit Ibiza Beach Club is the Balearic-Inspired Signature 15-Course Grill which features unlimited servings of grilled meats and seafood, barbecued and basted with Balearic marinades and spices. Included in the 15-course grill are Salads, Salmon, Jumbo Prawns, Calamari, Catch of the Day, Filet Mignon, Ribeye Steak, Beef Ribs, Lamb Chops, Leg of Lamb, Chicken Things, Pork Belly, Ostrich Steak and Glazed Pineapple. The Balearic-Inspired Signature 15-Course Grill is available every night at P2,200 nett per person or P2,700 nett per person inclusive of free-flowing wine. 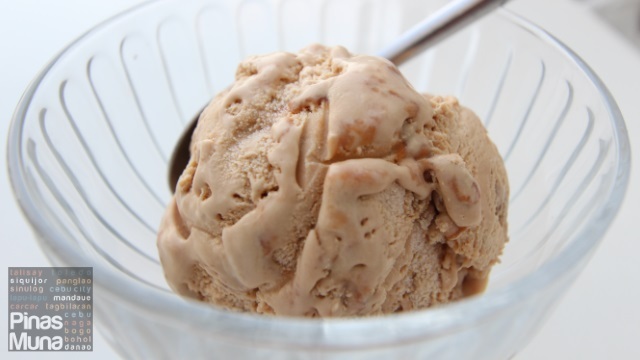 There's no better way to end the meal than with a scoop of your favorite Mövenpick Ice Cream. After dinner, it's time to get back to our room to enjoy the rest of the evening in the comfort of our bed. It didn't take long for us to fall asleep especially when you envelop yourself with a plush duvet which keeps you warm in a well air-conditioned room. It's "good night" for now. The following morning, we welcomed the sunrise at the hotel's beachfront. The calm waters of the sea was very inviting we decided to have an early swim. The sunlight wasn't that intense and the warm weather made us really enjoy the beach. Next to the beach is the beach garden that is ideal for a morning stretching exercise. The hotel also organizes group exercises, yoga and Zumba sessions which guests can join during their stay. 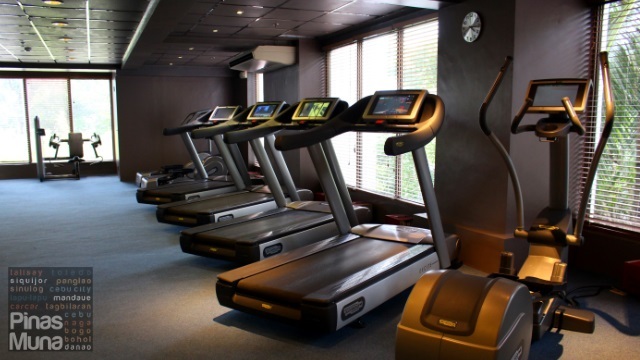 The hotel also has a Fitness Center that is open 24 hours so that guests can use the facilities at any time of the day or night. The Fitness Center is fully equipped with cardiovascular and resistance machines that meet any level of training requirement. After your morning workout, you must be famished and ready to replenish your body with a power breakfast. 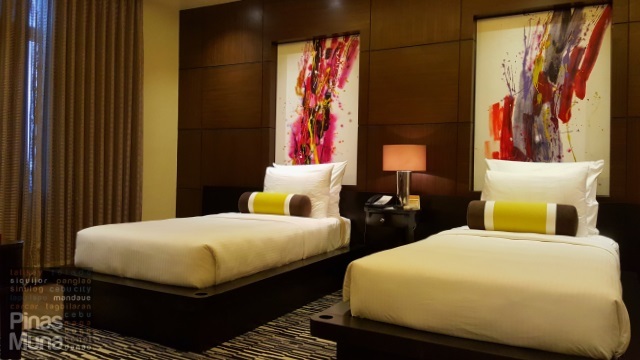 Overnight stay at Mövenpick Hotel Mactan Island Cebu includes complimentary daily breakfast buffet for two persons at The Sails which is known for its extensive selection of breakfast items. 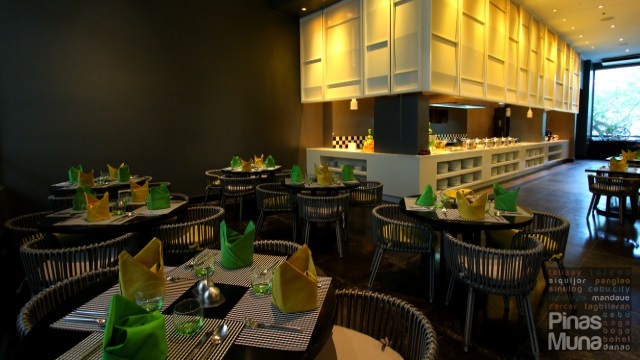 The breakfast buffet features a variety of freshly baked breads and pastries, an assortment of cheeses and cold cuts, fresh fruits and salads, as well as cereals and yogurts. There's also a wide selection of Asian dishes including dimsum, noodle soups, Korean breakfast items, as well as Filipino and Cebuano favorites such as danggit, chorizo, tapa and adobo. Back in November 2015, we included Mövenpick Hotel Mactan Island Cebu in our 2016 Travel & Dine wishlist and this year, we are happy to have this wish finally granted. We totally love every single moment we spent at the hotel. The customer service was outstanding, the food was absolutely great, the ice cream and the 15-course grill at Ibiza Beach Club were totally amazing. We will definitely keep coming back here at Mövenpick Hotel Mactan Island Cebu.